Throughout the first stretch of the 2017-18 season, the Calgary Flames have been a club that’s underachieved. Thought to be a team on the rise due to their strong finish to the 2016-17 season and off-season additions of goaltender Mike Smith and blueliner Travis Hamonic to an already strong group, instead the Flames have muddled around in the middle of the NHL’s pack. They’re hardly Arizona Coyotes bad, but they’re nowhere near where their own internal expectations had them either. As the holiday season is upon us and the NHL’s Christmas break is underway, here are five things that the Flames hope Santa Claus can somehow fit down the chimney for their group. For all the talk of depth, the Flames are in many ways a team that will go as far as their top line can take them. Consisting of Johnny Gaudreau, Sean Monahan and Micheal Ferland, the Flames’ top line was white-hot early in this season but quieted down considerably during December – the trio combined for 29 points in October, 45 points in November and just 18 points thus far in December. While the mail has been carried in December, scoring-wise, by the third line of Sam Bennett, Mark Jankowski and Garnet Hathaway, that’s not exactly a recipe for success. The top guns will need to find their swagger and consistency again for the Flames to move up the standings. 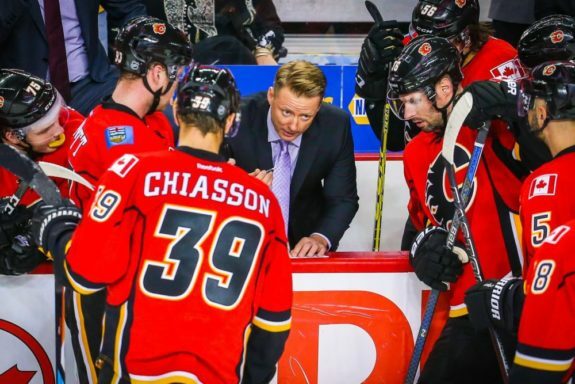 Flames head coach Glen Gulutzan often preaches that a team that doesn’t win the special teams battle in a given game doesn’t stand a good chance of winning. Far too often this season, the Flames have been in the red when looking at the combined efforts of their power play and penalty kill – on 11 occasions, they’ve allowed more power play goals than they’ve scored. Through 36 games, the Flames have the 20th-ranked power play and the 25th-ranked penalty kill. If they want to be a high-performing team and make some noise in the playoffs, they’ll need better results from their special teams units in these high-leverage situations. General manager Brad Treliving has joked in interviews that scoring is one of the things that keep him up at night. While the comments were made partially in jest, the Flames sit at 24th in the NHL in goals per game. Simply put: they’re not scoring enough goals. Granted, a great deal of that can be explained by (a) their poor power play and (b) bad puck luck – their 6.9% even strength shooting percentage is 27th in the NHL and not at all indicative at the number and quality of shots they’re getting. #Flames C Mark Jankowski received the news every call-up hopes for earlier this week — check out of the hotel, find a place. Has moved in with D Brett Kulak. That said, Treliving can’t help but think that his group could use some additional help. Jaromir Jagr was signed and Jankowski was promoted from the AHL early in the season, with both additions seeking to give Gulutzan some additional offensive options. Additional moves of a similar nature, adding some potential weapons to the bottom six, could be in the works if the price is right. Arguably the heart and soul of the team, Versteeg was placed on the injured reserve on Nov. 24 as he underwent hip surgery. The timeline for recovery from a labrum injury is roughly four to six months. If everything goes perfectly well, Versteeg might make it back for the playoffs. Considering the minutes he plays, the experience he brings and his importance in the locker room, adding Versteeg for the post-season would be a huge boost. Since the June 2013 flooding of the Saddledome, the Flames have been pursuing a new arena. It’s been a major topic of discussion around Calgary since the August 2015 unveiling of the CalgaryNEXT mega-project, which has been since abandoned, and it even became a major issue at the center of the recent municipal election. Calgarians have been hearing about the arena ad nauseum for years. For everyone’s sanity, and so it can stop over-shadowing the efforts on the ice, hopefully Santa Claus can bring the lengthy saga to a merciful close.